We have featured portable pico projectors and handheld camcorders on Skatter Tech, but what about a device that can do both? The latest 3M creation is the Shoot ‘n Share which makes it possible to capture precious moments digitally and to playback recordings on a large screen instantly. With both a pico projector and a camera under the hood, this gizmo is unlike any other device on the market. The Shoot ‘n Share is about 4.9 inches tall, 2.5 inches wide, and an inch thick. This makes length and width approximately the size of a large smart phone, but the depth makes it appear rather bulky. 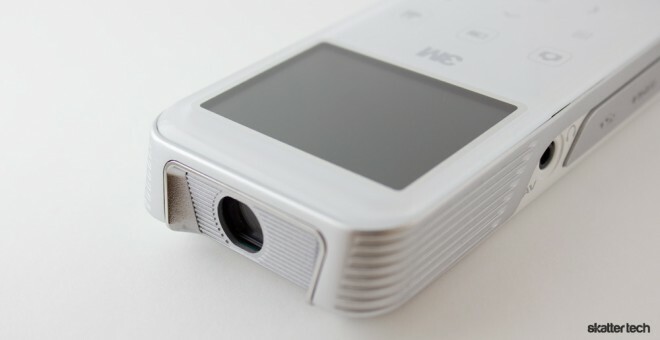 Considering that camera sensors are fairly small these days, I am guessing that the pico projector component consumes most of the space inside. The device is also lighter than it appears weighing just 5.6 ounces. This is definitely bulkier than most point-and-shoot cameras, but it is still small enough to slide into a pocket or carry in a bag. The front face has a 2.4 inch display above a set of capacitive touch buttons for navigating through the on-screen interface. I should note that using the software feels rather primitive after spending so much time with advance smart phones. A power button, microSD card slot and a focus adjustment wheel are on the right side. An AV output jack and a HDMI port are on the left side along with a mini USB port which doubles for charging and data transfer. (Sticking to microUSB would have been nice.) The projector lens is on the top while a camera lens along with flash is on the bottom. There is also threading for use with a standard tripod, which is a neat touch. The build quality is pretty robust, but the plastic materials take away any expensive or premium feel. The flimsy flaps covering connectivity ports are especially a bad idea. It looks like the Shoot ‘n Share is a design from at least 5 or more years ago. Although not necessarily ugly, 3M should slim down and get designers to envision an entirely new look. A more attractive body would definitely draw in more attention even if expensive or if there are other flaws. The Shoot ‘n Share can capture video at 720p (1280-by-720 pixels) resolution and can snap 5 megapixel still images. I would have to say that video quality is actually not bad. It is definitely not on par with a dedicated camcorder, but it does definitely beat the quality of video captured on many smart phones. There is also a LED flash which can stay on when recording in poorly lit environments. It actually did an impressive job of brightening up anything within a 10 foot range. Captured images are not nearly as good-looking as video since there is a lack of sharpness and a bit of blur comes with each photo. Quality is better outdoors and in bright areas. 3M mentions auto focus, but the lens is most definitely fixed focus. A future Shoot ‘n Share iteration should definitely opt for an auto focus sensor, which is not exactly a far-fetched request considering that even slim smart phones have the technology inside. When it comes to storage, 3M made one major mistake. The Shoot ‘n Share only has about 14 MB of internal storage space. This means room for just a handful of photos or a few seconds of video. I found that 1 hour of video consumes about 3 GB of storage space and a full 5 megapixel image takes up around 1-2 MB. Although microSD cards are affordable and easily available, one should come in the packaging. In fact, I think 3M should also include at least 4 GB of on board storage as well. I can only imagine buyers taking one of these home to find that it is unusable out of the box. Although the Shoot ‘n Share boots up using the on-screen display, clicking on a dedicated button projects the same interface onto a wall. It takes only a few seconds to turn on and the image gets up to full brightness within a minute. For those wondering, this device projects at 14 lumens when plugged in and at 12 lumens when running on batteries which makes it nearly identical to the specifications of the 3M MPro120 we reviewed last year. This unfortunately also means that the projected image is quite difficult to see in a normal office setting or even in a naturally lit room. Turning off the lights and drawing the curtains helps, but this is probably less than ideal. 3M claims the Shoot ‘n Share can project to a size of up 65 inches in diagonal, but in practice I found that 40 inches was ideal for a good mix of enough brightness and image quality. Due to the standard LCoS display technology, users will need to manually focus the image with an analog dial on the side. It is not problematic, but I wish it was always in focus like the laser-powered MicroVision SHOWWX+ pico projector. In terms of quality, the Shoot ‘n Share projects at a VGA (640-by-480 pixel) resolution which is a 4:3 aspect ratio. I am not sure whether high-definition pico projector technology is available yet, but the current setup feels like odd since the same device also captures video at 720p. I also found that the on-board software can playback downloaded video podcasts. I watched a short TED Talk video without any issues. The built-in speakers are also loud enough for a party of few to hear easily. It is also possible to plug-in a pair of headphones or a set of external speakers. 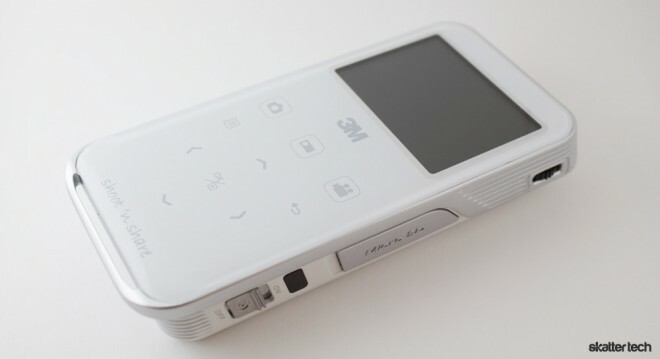 The 100 mAh battery provides about two hours of projection. It lasts approximately the same amount for capturing video too. Recharging is thankfully easy using the included AC adapter or the provided mini USB cable. Plugging into a USB port of a computer turns the Shoot ‘n Share into a mass storage device for those who do not have a SD card adapter on hand. Although 3M does not include a cable, those looking to watch recorded videos on a traditional HDTV can use the HDMI output. Fortunately, at least a composite video cable comes in the packaging. The Shoot ‘n Share is also compatible with optional accessories such as a cable for Apple devices, component video cables, an infrared remote control, and a car charger. 3M definitely stumbled onto something interesting. 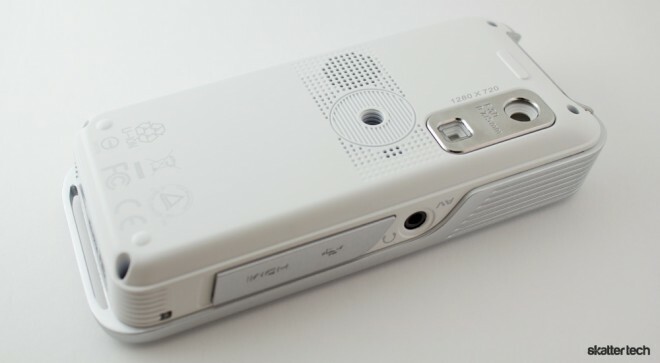 There are probably no more than a handful of device that feature both a camera and a pico projector inside. The Shoot ‘n Share will undoubtedly impress others since its relatively unknown. Battery life is respectable, but recoding quality could be better and the projector also has room for improvement. Those looking to pick one up should also purchase a microSD card as well since 3M does not include one. It is hard to tell whether the Shoot ‘n Share is selling well or whether 3M will pursue a newer iteration down the road, but I can say it is one unique gizmo. It does a pretty impressive job for a first generation device and I can only hope a future iteration will improve on current flaws. It is also a bit expensive with a suggested retail price of $299, but shopping around will get you the Shoot ‘n Share for as little as $249 through retailers such as Amazon. seems cool… though i’m not sure why i’d want a camera built in… I’m not professional videographer and even those guys need to edit their films before showing them! i’d rather shoot it, edit it, and then share it…. and with something a little more powerful so that i was not limited to totally dark rooms… i don’t have one but something like the aaxa m1?